Tell us your story. How did Temps d’Oci Incoming get started? Temps d’Oci (Outgoing) started in 1992. 10 years later, we started the Incoming department. Since the 2000s, Barcelona had a huge demand of incoming services for all types of tourists and companies. We thought then that being a specialist in the student incoming market would be a good differentiation from other local agencies in the industry. What makes Temps d’Oci Incoming different from your competitors? Certainly, the quality and supervision of our programmes and services and the high level of efficiency in dealing with potential situations. This results in a very low level of incidents, which is very appreciated by our clients. In addition, I would say that our catalogue, with a wide range of activities and educational visits for students is remarkable. 2018 has also been a great success. We have reached the maximum quantity of students we have ever had – we successfully managed more than 10,000 people. What can we expect to see from Temps d’Oci Incoming in the future? Our goal is not to be seen just as a simple provider of services. We prefer to be considered by our clients as a loyal and confident partner for all their operations in Spain and Portugal. The trend in educational travel is to experience the local culture more and more during the trip (gastronomy, festivities, language, political situations – all in genuine experiences). For example, we have had an increase in demand of information and activities related with Catalonia (e.g. culture, politics, etc.) during the last two years with groups staying in Barcelona. We think that a trip to any destination should improve your knowledge thanks to local experiences. You can see this meaning in our promotional material and in our slogan – “Those who travel, live twice”. How do you work to ensure the health and safety of young travellers involved with Temps d’Oci Incoming? We always work with providers who can guarantee good service and products. We supervise and audit our providers prior to the arrival of the groups and make checks after the experience. We register and analyse incidents to avoid them from happening again, and thanks to our 24 h service, we act very quickly in any circumstance. We are prepared to grow and to offer our services to more agencies. We intend to have more visibility in the market and increase our international contacts by joining WYSE Travel Confederation. Yes we did, and we are very satisfied with the results. Tourism is a very sensible industry and any instability affects us negatively: an economic crisis, a terrorist attack, strikes in transportation… But right now, as the UK is one of our main markets, obviously Brexit is our most important challenge nowadays. 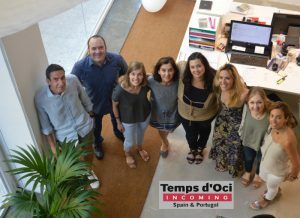 At TEMPS D’OCI INCOMING we offer B2B services specialised in providing affordable quality programmes that create memorable experiences for students throughout Spain, Portugal, France and other countries in Europe including Morocco. For over 15 years we have been a trusted provider of youth group travel services. Along the way we have developed wonderful lasting relationships with both our local service providers and our international clients. With excellent local knowledge, guaranteed trusted networks and the flexibility to adapt to every client’s specific needs, TDO Incoming goes above and beyond to deliver incoming services that really make a difference.